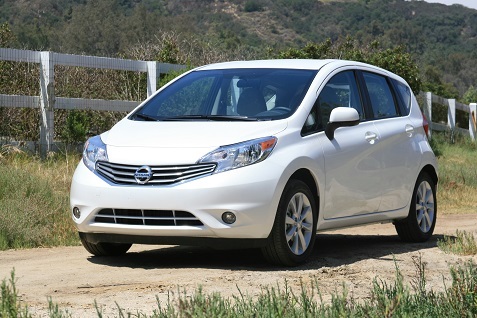 After updating the 4-door Versa sedan, Nissan has now turned to the 5-door hatchback with the all-new 2014 Versa Note. While they share the Versa name, the vehicles hardly look like siblings, with the 4-door Versa having the new Nissan grille across their sedan lineup while the Versa Note has a completely different front fascia that’s much more appropriate for the hatchback design. Buyers in this segment thus have two options from Nissan depending on their style tastes and practical needs. Nissan is the leader in this segment with both versions of the Versa offering designs that appeal to a wider demographic. They aren’t going with “quirky” design concepts in an attempt to woe younger buyers. The target market includes practical buyers in their 30s, particularly couples without children, looking for “functionality, versatility and value” but still wanting a stylish vehicle. You can see from the photos that the design should appeal to this target market along with a wider demographic without turning anyone off with design elements that are too aggressive. Nissan is emphasizing the roominess of the interior, and I was impressed when I sat in the back seat. There’s plenty of legroom and you don’t feel like you’re in a compact vehicle. The Versa Note offers a segment-leading 38.3 inches of back row legroom and 21.4 cubic feet of cargo space. The Versa Note also offers a Drive-N-Hide adjustable floor in the back so drivers can tuck away items like computers. The front seats also offered plenty of room so I never felt cramped in the Note. They’re targeting buyers with an active lifestyle, so the functionality provided by the back hatch and fold-down back seats will be emphasized in their marketing plan, and you can see in the slideshow above a Versa Note that was loaded up with surfing gear for all of us to check out. The interior design is more understated than what you’ll see in other vehicles in this segment, which is consistent with Nissan’s goals with the Versa. Nissan is offering a robust technology package with a 5.8” touch-screen. I particularly like the Google Send-to-Car feature that lets drivers send an address from Google Maps directly to the navigation system of the vehicle. The Around View Monitor is particularly impressive and makes parking much easier. Just recently a feature like this was a selling point for higher end luxury cars, and now buyers can get it in a much less expensive vehicle. Fuel efficiency is another priority with the Versa Note, with 40 miles per gallon on the highway and a best-in-class 31 MPG city and 35 MPG combined. All the automakers are laser-focused on weight reduction, and Nissan was able to reduce the weight of the Note by over 300 pounds when compared to the previous hatchback model. Improvements to the CVT engine also helped to achieve these numbers. With the emphasis on fuel economy, it’s no surprise that the Versa Note didn’t blow me away with its performance. Still, the Note handles very well and I did enjoy our test drive along the San Diego coastline. The vehicle does not have a Sport or Eco drive mode option which is becoming more popular in small and larger vehicles. I like what Nissan has done with the new Versa and Versa Note, and they obviously know this segment as they’ve been the sales leader since 2008. They have two options with the four and five-dour versions that appeal to a wide variety of buyers. The vehicles are practical but stylish, and they’re not trying to be too cute with the designs. I’ll be surprised if this strategy doesn’t lead to continued success.